Growing up, it was always so weird to know that my family grew up with the Swayze's. Dirty Dancing was such a big deal of a movie when I was a kid, and Ghost was even a bigger deal to me because the lead character's name was Molly. “Molly, you in danger, girl!” is still a line that hilariously haunts me. My Gramma Bobbie did give me this instructional video on VHS. Amazing. My Grandma, Bobbie Mahoney, was best friends with Patsy from day one. Literally. Their mother's were very close and they often shared a crib. They stayed close while my dad and his large family grew up in Houston, Texas. Eventually both families migrated out to the West Coast. While they no longer lived in the same city, they still kept in touch. I remember my Gramma Bobbie going to Patrick Swayze's wedding and asking her to bring back an autograph for me. HA!! Now I see that that is the most ridiculous request ever… but at the time I thought it made perfect sense. Can you IMAGINE!? Congrats on your wedding… could you sign this poster for my grandaughter? AWKWARD!! After moving to California, Patsy started her own dance studio and continued to choreograph. She choreographed over 20 films including “Urban Cowboy.” I only met her a few times, and she was always the sweetest most supportive thing. She was PATIENT too cause goodness knows I was determined to put on a mini musical every time she was around. When I was 13ish our family had a table an an event in LA where she was honored as a force in the arts. Patrick got there late and she was worried about “Buddy” getting him something to eat (they didn't call him Patrick). My sister and I LEPT at the chance to get him a plate of food from the buffet. Of course, like a bossy older sister, I wouldn't even let my sis hold the plate. (I don't know how my awesome sister dealt with me) When we brought him the food, I'll never forget the moment when he kissed my check. I thought I had died! Silly 13 year old heaven. Although I didn't really know her, my heart is so heavy with her passing. I guess it just reminds me that so many amazing forces in this world are getting older and inevitably moving on. HOWEVER… here's how I'm going to take this news. Torches are passed down and it's our responsibility to carry on tradition. I've always been inspired by Mrs. Swayze. She inspired young and old performers for years and taught her son to dance who went on to have a successful Broadway and Film career. While I miss performing from time to time, I am beyond grateful for gift I have been given in each and every student I'm lucky enough to teach. Itt is sad to see Patsy go but, her legacy lives on in each and every life she touched as a dance teacher. She gave her students not only physical strength, but also strength of character, an ability to improvise with whatever comes their way, the confidence to light up a room, an appreciation for the arts, and an appreciation for life it self. My goal, everyday, is to do the same. Thank you, Patsy Swayze, for being an inspiration and for playing such an important role in my Gramma Bobbie's life as a friend. By Devin KellySeptember 19, 2013, 8:39 p.m. The note Patsy Swayze tucked in her son Don's suitcase was simple but meaningful. It was 1980, and Don had just moved to California to pursue an acting career. He was sleeping on his older brother Patrick's couch and scared to death of the prospect of auditions. Then he found the note from his mom. It began, “Donny,” and followed with a laundry list of all the awards he'd ever received. Remember when you won the second grade spelling bee? Remember the Pee Wee World Series in baseball? Patsy Swayze — a dance teacher and choreographer whose most famous students included her son Patrick and “Fame” director Debbie Allen — died Monday at her Simi Valley home after a stroke on Sept. 8, Don Swayze said. She was 86. Her former students include Broadway star Tommy Tune and actors Randy Quaid and Jaclyn Smith. All five of Swayze's children became dancers and actors — most famously Patrick, who trained in her studio and struck stardom in 1987 with “Dirty Dancing.” Patrick Swayze died ofpancreatic cancer in 2009 at age 57. Feisty and demanding, Swayze devoted herself to nurturing talent and potential. Yvonne Helen Karnes, nicknamed “Patsy,” was born Feb. 7, 1927, and grew up in Houston. Her father was a World War Ipilot and a geologist. Her mother was a nurse. At age 10, Swayze was hit by a car. She enrolled in dance classes for therapy, eventually training in classical ballet and jazz dance. While in high school, Patsy met and married Jesse Wayne Swayze, a mechanical engineer. He had a sense of humor; she was serious about homework, behavior and posture. Swayze founded and directed the Houston Jazz Ballet Company and was a resident choreographer at a number of Houston institutions. She also taught dance at the University of Houston and ran an independent studio, outfitted with a swimming pool, two dance studio rooms, trampolines and gymnastics equipment. She was known as a firm disciplinarian who had no qualms about sending any girl who showed up to class wearing makeup to scrub off in the bathroom. That studio was where Patrick Swayze met his future wife, Lisa Niemi, another of his mother's students. 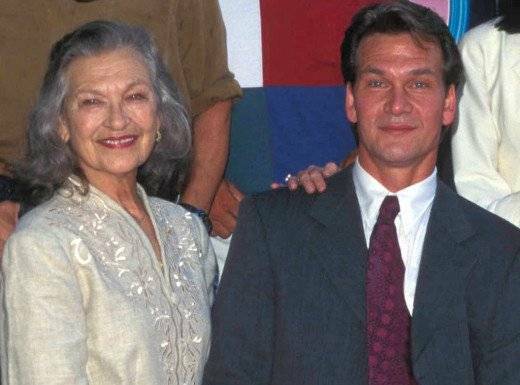 Patrick Swayze spoke later of his mom's strictness — he felt she was harder on him than on anybody else. But after “Dirty Dancing,” he realized why, Don Swayze said. She was also adept at teaching herself. Called upon to work on “Urban Cowboy,” Swayze knew little about country dancing. She headed out to country-style bars to learn the style. In 1981, after the success of “Cowboy,” Swayze moved to California. She planned to retire from teaching and focus on film work, but opened a dance studio in a Simi Valley shopping center that operated for more than two decades. Her husband died of a heart attack in 1982; her daughter Vicky died in 1994. Besides her son Don, she is survived by son Sean, daughter Bambi, and six grandchildren.